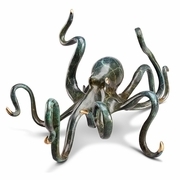 Deep-Sea Delight Octopuss Brass Sculpture. Looks like it's ready to crawl across your desktop or display cabinet. Measures: 5.5"H x 10.5"W x 8"D. Brass.